The 11th ICT4D Conference: The Global Digital Development Conference is rapidly approaching, and the Conference would like to highlight all of the wonderful speakers and sessions planned that deal with digital trends and innovations in the host country: Uganda. From innovations in agriculture and health to humanitarian response and infrastructure, there are lots of exciting things going on in Uganda and conference staff and attendees cannot wait to hear all about them at this year’s ICT4D Conference! In the Conference Track for Agriculture, there is a highly informative session planned from William Luyinda of the Akorion Company LTD that deals with how unlocking farmers’ access to finance, unlocks endless farming possibilities! The Conference organizers are very excited about William’s presentation, as it will cover Akorion’s EzyAgric, a mobile and web app, and a one-stop shop for farmers and agribusinesses. EzyAgric has provided production, marketing and financial services to 62,000 farmers through 510 youth village agents under 40 farmers cooperatives in 3 years. As the youth provide services to the farmers, EzyAgric automatically captures farmer production details, seasonal transaction, and agricultural income data. These agricultural analytics are used by the agribusinesses to provide better services and financial support. Additionally, the Conference has another session planned from Sulakshana Gupta of Viamo Inc. that deals with the financial side of agriculture. In Sulakshana’s presentation, they plan to discuss ‘dialing for dollars’ or how simple IVR calls led to significant savings for smallholder farmers in Uganda and Ghana. Mercy Corps also plans to present on how GIS technology can enhance the agricultural sector. Leon Liu will speak about how GPS helps refugees gain access to land. With the influx of one million South Sudanese refugees over the past two years, host communities in Northern Uganda are experiencing a new reality as tens of thousands of people settle in towns and cities that popped up overnight. Farming is a key source of income in Uganda and one of the most viable livelihood pathways for refugees as they settle into a new life. However, accessing land outside of the refugee settlements requires negotiating with host landowners if refugees are to farm bigger plots viable for commercial agriculture. To address this challenge, Mercy Corps worked with refugee and host community farmers employing GPS technology to determine the precise location and size of landowners’ plots. The new information about the size of their land incentivized landowners to allocate more land for refugees to cultivate their crops. In the speaking track for Digital Diversity, the Conference has a planned presenter from BarefootLaw, which provides the public with free legal information and assistance using innovative approaches. They use technology in addition to traditional methods to offer free legal advice! Their presenter, Michael Kwizera, will present on how digital tools can be used for inclusion. His discussion will focus on sharing lessons BarefootLaw has learned over the years on how digital tools can be used to increase women’s access to justice and legal empowerment. Due to several factors, many vulnerable Ugandans, including women and youth, have very limited access to legal services – particularly in rural areas. For this reason, BarefootLaw has been creatively utilizing digital solutions to provide these services while overcoming barriers of geography, courts’ coverage, knowledge and cost. 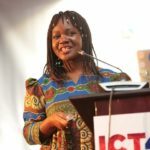 In the Conference Track for Education and Digital Literacy, there is a spectacular presentation planned from Clare Sempebwa Seruwagi of Checheza regarding digital tools for early learning. Uganda sees a lack of localized digital learning content, especially for early primary and pre-primary learners. A game-based approach can provide both motivation and a way to engage soon-to-be-readers in learning materials. Checheza, a Swedish-Ugandan startup, through their open platform can connect quality educational content with local learners. The approach is to work with educational experts globally and connect tested and validated learning games to their platform. Localization of this content is done with local partners, to make sure that content is relevant for Ugandan children. The platform and approach are scalable and can be applied to other countries. With strong engagement from the local community, an early pilot in Bududa District has shown improvements in English among 150 children in a large age range. Moving forward, Checheza, with guidance of NCDC, works to extend the platform to meet growing needs of digital tools for both in-school and out-of-school use. In the theme of digital literacy, there are two presenters from Geo Gecko who plan to discuss Geographic Information Systems and how, if properly utilized, have enormous power to transform lives in Uganda! First, there is Lars Agerskov Christensen who will be discussing Open Street Map and how to go beyond just a nice map and actually create geo-intelligence. Next, there is Lydia Tasia who plans to discuss how to get started with free and open source GIS tools, and how data analysis and visualization does not have to cost your organization precious time or resources. Attend these sessions if you would like to know how your organization could benefit from the use of GIS in its programming! In the Health and Nutrition track at this year’s Conference, there are a multitude of sessions planned that involve digital trends and innovations in health and nutrition in Uganda. First, there will be Caroline Kyozira of the Ugandan Ministry of Health regarding eHealth leadership and governance via the Ugandan approach. Caroline’s discussion will touch upon how engineering an enterprise information system of the scale and complexity of a national health information system poses unique and complex challenges for Uganda. Furthermore, Caroline also has another planned presentation that will illuminate progress, gaps, and a future roadmap for holistic health information system strengthening in Uganda. Also, from the Ugandan Ministry of Health, Jamiiru Mpiima plans to discuss the development of a national health worker registry to support the implementation of National Health Workforce Accounts (NHWAs). Next, there is another wonderful presentation planned from Ismail Wadembere of IntraHealth about developing NHWAs using iHRIS – an open source human resources information solution. IntraHealth International in Uganda is developing tools based on iHRIS to support government reporting for NHWA. Ismail also plans to present on how low health worker attendance is a barrier to improving health outcomes, resulting in reduced productivity, disruption of health care delivery and poor access to services by the population; and, an integrated approach to tracking worker attendance to duty for universal health coverage. Finally, there is a planned presentation from Lauren Hughey of the Spoon Foundation discussing how mNutrition programming is filling the gap for children with disabilities in Uganda and Zambia. 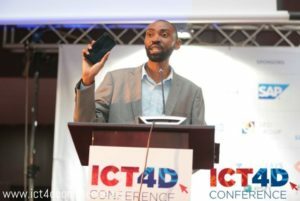 The ICT4D Conference has another great presentation planned from Davis Musinguzi of The Medical Concierge Group who will discuss Mirembe – an artificially intelligent health chat bot – and its user experiences from Uganda. Mirembe is a free triage and first-line advice chat bot that can be accessed by users anywhere at any time utilizing Facebook Messenger! Next, will be Elisha Nangosha of World Vision International (WVI) who plans to talk about the mHealth Assessment & Planning for Scale (MAPS) toolkit and how it was used to avoid the increasing number of mHealth projects with initial success, but then are unable to integrate with the national health system. In addition to Elisha, there is another WVI speaker planned – Daniel Irongo – who will discuss how the Government of Uganda has undertaken a bold national effort to develop an Enterprise Architecture (EA) and Health Information Exchange (HIE) for e-health services in Uganda. WVI is an implementing partner in the Technical Working Group (TWG) that they have formed with a mandate of harmonizing all digital health applications in Uganda, including policy and strategic guidance to the Ministry. Catholic Relief Services (CRS), founder of the ICT4D Conference, also has speakers planned to present on Health and Nutrition this year. First, Michelle Ell of CRS will have a session on the use of Android tablets as a tool for strengthening the social service workforce and its potential for transformation at scale. Next, Dr. Daniel Oliver of CRS will present on the case of CommCare in Uganda and digital case management in social work settings. In addition to these exciting presentations, there is a presenter from the International Rescue Committee: James Tinkamanyire, an mHealth Specialist. He plans to discuss the Fifth Child Project, and how technology and health systems strengthening can be used to scale immunization coverage in Northern Uganda. In Northern Uganda only 65% of children receive all basic vaccinations, and only four in five children receive the third dose of DPT vaccine. This unvaccinated ‘fifth child’ is often present in remote locations that are underserved by the health system, and digital health interventions are key to reaching them. Finally, there is a session planned from Justus Ashaba of the Uganda National Tuberculosis Reference who will touch upon scaling up digital practices for a stronger laboratory-clinical interface in TB care through TBLIS – an electronic solution for TB laboratories to increase the quality of TB laboratory data, timeliness of results reporting, patient treatment outcomes and effective patient care. The ICT4D Conference’s Humanitarian Response and Resilience track is packed full of awesome presentations that highlight digital innovations and trends in Uganda. First, Reema Rustagi of QED Group LLC will speak on predictive identification of interventions for resilience in orphan and vulnerable children (OVC) households in Uganda. Also, there is Charlene Cabot of Response Innovation Lab (RIL) who plans to highlight case studies from RIL in Uganda and beyond! The RIL is a cross-sectoral initiative of Oxfam, Save the Children, World Vision, George Washington University and Civic. Next, there will be a presentation from Kenneth Stober of Simplifi Networks on communication challenges in Africa and some of the solutions that Simplifi provides to their customers. He will touch upon things such as long-distance point-to-point last kilometer connections, wifi networks in extremely remote locations, and even multi-point networks for better reliability and lower costs. Additionally, there will be Neckvilleus Kamwesigye of The Bantwana Initiative of World Education, Inc. who plans to discuss strengthening Uganda’s Child Protection System with a closed user group mobile phone network. In 2016, Ugandans reported over 200,000 child abuse cases to the National Child Helpline. Understaffing and weak links between districts and communities meant slow response and poor follow up of critical cases. Also, in 2016, WEI/B and MTN Uganda launched a Closed User Group (CUG) free, in-service phone network linking together district and community actors through calls and texts. In addition to the above presentations, there are several presenters who will discuss the use of Geographic Information Systems (GIS) in their presentations, and how it can be applied to humanitarian response and resilience. First, there is Geoffrey Kateregga of Humanitarian OpenStreetMaps who will share his insights regarding the Uganda open mapping program and how baseline geographical data can be used for disaster risk-reducing interventions and for efficient disaster response. Also, there is Tyler Radford of Humanitarian OpenStreetMaps who plans to discuss participatory mapping of Uganda’s refugee hosting districts. Finally, there is Bernard Wright of Geo Gecko who plans to discuss the use of UAVs in vulnerable urban communities. He will touch upon how UAVs have huge potential, but this can only be unlocked if they do not stand alone. Bernard will show Conference attendees how UAVs can support decision making through data collection and mapping. In the Responsible Data and Information Security Track, there is a speaker planned from the Medical Concierge Group, Dr. John Mark Bwanika, who plans to discuss how a lack of functional e-health policies are crippling efforts for responsible data and information security in African countries. The healthcare sector is receiving unprecedented attention from scientists and enthusiasts who are looking to digitize all aspects of service delivery and data collection. In Africa, this is largely driven by researchers, funding agencies and private healthcare players. This set of players recognizes the critical value proposition leading to cost-saving, more efficient visibility of operations at scale, as well as better development of intelligent systems that are data-centered. In this regard, most African governments lag behind, yet they are responsible for formulating the policies that govern the industry. With most government bodies playing catch-up on most of the demonstrated values of digital platforms in healthcare, industry policies gain low priority and are often delayed or sub-optimally implemented. With the private sector taking lead on the digital drive, there is then a huge gap in overall governance and collective national direction as every player determines their goals. In this kind of environment, there’s also no framework for overall oversight and regulation for healthcare data. As a result, most healthcare service providers do not meet and conform to internationally recognized data and information security standards. This puts the patients at great risk for privacy breach and information insecurity. There’s a need for accelerated e-health and health data security policies in order to ensure responsible data and information security. Another speaker relating to the Responsible Data and Information Security track is Rositsa Zaimova of Dalberg Data Insights. In her presentation, Rositsa plans to discuss AIDA in Uganda, the Action Insights Data platform, which was developed in partnership with the United Nations Capital Development Fund (UNCDF). The goal of AIDA is to accelerate the use of private and public data sources and to create an entire data ecosystem for the country, while complying to regulations and ensuring privacy. Dalberg has been developing various tools with different end-users around key industries/sectors, e.g. (i) smart cities with KCCA; (ii) food security with DIAL and FAO; (iii) financial inclusion with UNCDF; (iv) gender gap with Data2X. In the Supply Chain Track for this year’s ICT4D Conference, Dr. Yuehwern Yih of Purdue University will deliver a presentation regarding the medical supply chain for maternal health in Uganda. Dr. Yuehwen will present a case study on an innovation of sensing true demands for medical supplies by triangulation laboratory tests, patient records, and supply stock levels to improve maternal health. Furthermore, he will demonstrate an integrated solution, E+TRA HEALTH, that supports health supply chain management with real-time data for patient records, laboratory tests, and medical supply stock levels. It assists in reporting and predicting true demands of essential medications at child birth. This E+TRA HEALTH with cloud-based smart sync technology, developed based on open sources platforms, is specifically designed based on health worker’s workflow and Uganda health facility settings. It works without internet, but intermittent internet is recommended for system updates and backups. In the Youth Engagement track for this year’s ICT4D Conference, Omalla Johnson Dennis of Smartup Factory Uganda will discuss how the Youth Innovation Hub Smartup Factory is utilizing digital technology to empower marginalized youth in Uganda. The Smartup Factory Uganda was founded to create an inspiring youth-led space where marginalized and poor young people aged 17-26 can learn human centered design thinking, gain access to technology, information and incubate locally relevant innovations. Over the past three years, Smartup Factory has reached 4,000 youth and currently operates across 7 hubs in Uganda (Kampala x 3, Kamuli, Tororo, Gulu & Alebtong). In the presentation, Omalla will explain what technologies are being used at these hubs (such as offline servers to tackle slow connections and high internet prices, survey response systems to enable quick and anonymous feedback, Arduino kits for practicing electronics, social media channels for communication and video equipment to broadcast online) and how they have helped to build their skills and empower youth with difficult backgrounds in Uganda. There is also Desire Rukud’de of Geo Gecko who will be discussing The Kampala Portal, which is an open source tool aimed at making service delivery related data and information available to local authorities and the public. The tool is built on the backbone of four pillars aimed at (i) identifying key partners’ operations and the nature of their engagement in Kampala, (ii) mapping infrastructure points designed to deliver predetermined services (e.g. schools), (iii) summarizing parish level specific socio-economic profiles, and ultimately (iv) offer insight into the lives of young Ugandan adolescent girls accessing such service in Uganda’s capital city. Finally, there is Deogratius Kiggudde of Humanitarian OpenStreetMaps who will touch upon youth digitizing Uganda through YouthMappers – an international university consortium on Mapping for Resilience. The consortium organizes a global community of learners, researchers, educators, and scholars to create and use open geographic data that directly address locally defined development challenges worldwide. Uganda has 8 YouthMapper chapters situated in all regions of the country. The Humanitarian OpenStreetMap Team has engaged these youth in creating the biggest open data source in the country OSM! 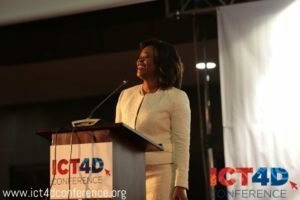 The 11th ICT4D Conference at the Speke Resort Munyonyo in Kampala from April 30th to May 3rd, 2019 will feature over 250 sessions including: keynote addresses, case studies, product demonstrations, interactive learning sessions, and much more! For more information, including how to register, please visit: https://www.ict4dconference.org/!